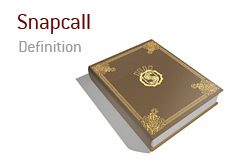 What is meant by the term "snapcall? in poker? What does the term "snapcall" mean? A "snapcall" is when a player calls a bet without taking even a moment to think about it. It's a call that is made instantly. The term "snapcall" is usually used when one player commits the last of their chips, and another player has the "nuts" or something close to it and instantly makes a call. Let's give a few examples of when the term "snapcall" would be used. With the board reading A-A-8-7-6, a player pushes all-in. There is only one other player still in the hand, and he is holding pocket Aces. Seeing as how he has an unbeatable hand (there are no straight flush possibilities on board), the player with the pocket Aces "snapcalls" the all-in bet. There is absolutely no reason for him to think about the hand, as he has the absolute nuts. A player is on tilt in a cash game after losing a big pot. He is pushing all-in on every hand. Once again, the player on tilt pushes all-in. Everybody folds around to you in the BB. You look down at pocket Queens and "snapcall", as you are almost certainly ahead of the player on tilt. The player on tilt sheepishly turns over 3-6 offsuit, your pocket Queens hold up, and you take the last of his chips.